A woman who holds the record for the world’s longest climb will be giving a talk at Auchnagatt village hall next month. Pauline will be arriving in the area next month when she will do a presentation of her talk and handover of monies raised by Auchnagatt Primary School . The school pupils have raised enough cash to rebuild and be twinned with a school in Nepal. As well as entering the record books for completing the climb, at reaching the base of Everest Pauline met her husband who helped her get to the summit and they became the first British couple to summit Mount Everest. The Auchnagatt event will run from 6.30pm to 8.30pm and includes coffee and cakes. Entry is by ticket, which costs £5, while Pauline’s book ‘The World’s Longest Climb’ will also be on sale on the night at £5 (usual RRP £15). All monies raised from the evening will go to the In Your Hands charity. The charity was founded by Pauline and her friend Jo Pawley to raise cash to build schools in Nepal which were devastated after the earthquake in 2015. The concept is not only to re-build the school and give the children in little villages a fair chance at an education, but it also twins the school with a school back here in the UK so both schools can send blogs and make videos exchanging information around religions, what they learn at school or what they get up to at play time. Pauline’s love for Nepal and its people came from living and working there for four years. The country is one of the poorest in the world. 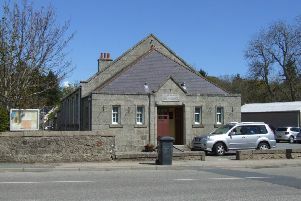 Tickets for the village hall event can be purchased from Auchnagatt School, J&K Shoes, Ellon or by calling Norman Cunningham on 07515 895533 or Angela Winn on 07799 410060.